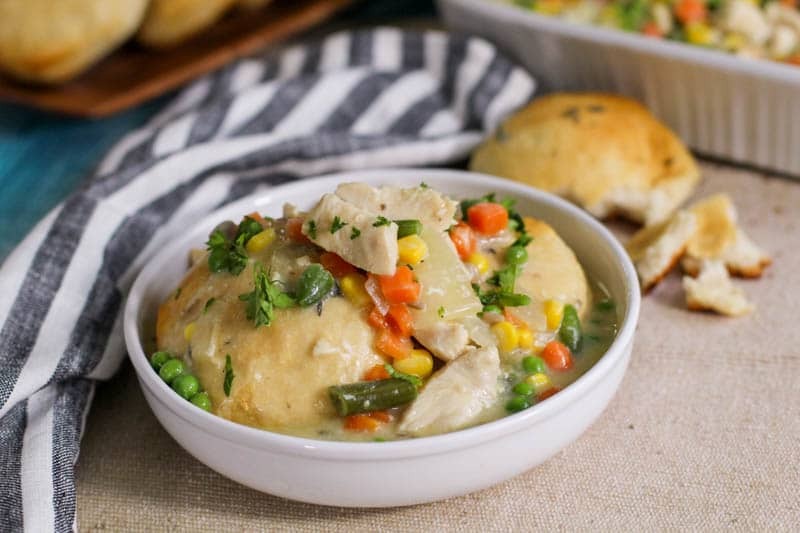 Crockpot Chicken and Dumplings is one of the easiest recipes we make! Made with biscuits, frozen vegetables and cream of chicken soup, it has a taste you’ll adore. Hopefully it will quickly become one of your family’s favorites! We love using our slow cooker on a daily basis and have several favorite slow cooker chicken dishes. You may want to check out Grandma’s Crockpot Chicken & Noodles and Crockpot Chicken Tacos. How Do You Make Chicken and Dumplings in a Crockpot? The process is simple. We decided to chop our chicken first, but you could easily leave your chicken in whole pieces and chop it up after it’s cooked. After that, you basically just dump all of the ingredients into the slow cooker and cook it for several hours. For the biscuits, we use canned biscuits. You could cut them into several pieces and let them cook in the mixture for an hour at the end of the cooking cycle or you could precook the biscuits in the oven and add them individually to the bowls. Can Crockpot Chicken and Dumplings be Frozen? Yes. I prefer to freeze my meals before they’re already cooked with the Freezer to Slow Cooker method. But, if you have leftovers and want to freeze them up, that’s totally fine to do as well. Just place them in a freezer safe bag or container and freeze until you’re ready to reheat them. 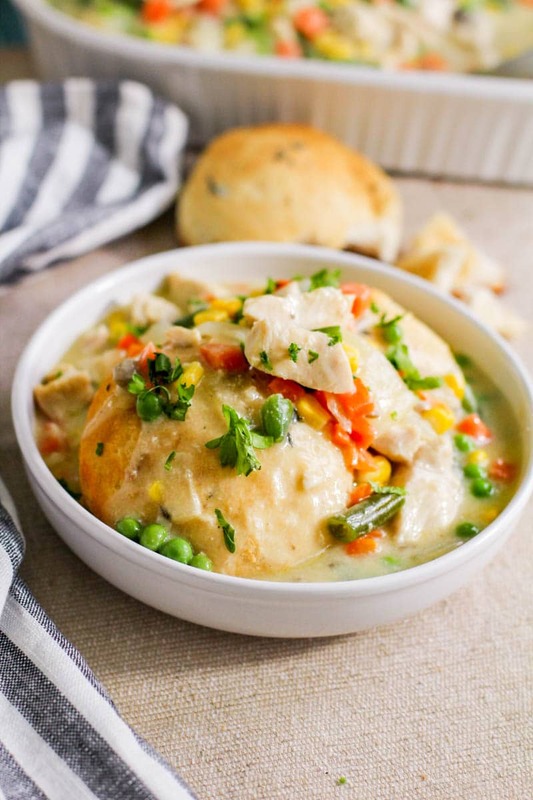 Can I Use Homemade Biscuits in Crockpot Chicken and Dumplings? Yes, many people have a favorite biscuit recipe that they would prefer, rather than the can of refrigerated biscuits. If you do, just mix it up and drop in spoonfuls of biscuit dough and let them cook for an hour as well. Or, if you prefer, you can also bake them in the oven and add the cooked biscuits to your dish. 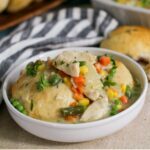 Crockpot Chicken and Dumplings is one of the easiest recipes we make! Made with biscuits, frozen vegetables and cream of chicken soup, it has a taste you'll adore. Hopefully it will quickly become one of your family's favorites! Mix chicken, onion and frozen vegetables and 2 cans of cream of chicken soup in the slow cooker. Cover and cook on high for another hour. The biscuits are done when you can insert a knife and it comes out clean. They will be spongey and will brown a bit on the sides and top. Mix chicken, onion and frozen vegetables and 2 cans of cream of chicken soup in a gallon sized freezer bag. Thaw freezer bag before cooking. It can go in when still frozen, but you’ll need to add an hour of cooking time. An hour before serving, shred chicken with two large forks, and drop in the biscuit dough. Cover and cook on high for another hour. The biscuits are done when you can insert a knife and it comes out clean. They will be spongey and will brown a bit on the sides and top. You can cook biscuits in oven if you prefer and add them at the end, however they may lose their dumpling texture of being cooked in all the juices of the food. No, just the can of soup without the water or milk. Ok, I’ve just thrown all the ingredients into my crock… My only question is on the biscuits. Do I need to cut them into fourths? Stir them in? Or just drop whole biscuits in on top? Hope you see this in time for dinner. I’m so excited to taste the finished product. Thank you!!! Sorry for the delay in responding Tara. No, I always throw mine in frozen and it turns out great!